The Dreifaltigkeitskirche or Trinity Church is considered to be the most significant church in the "Neustadt" or "New City" near Linzergasse on the right side of the River Salzach relative to the Old City. It was the first major building by Fischer von Erlach, who also built the Kollegienkirche and the Markuskirche in the Old Town of Salzburg. It has many characteristics of a von Erlach church: the central dome, a playful façade and the two towers make the Dreifaltigkeitskirche appear like a palace and the 19th century Makartplatz in front of it grants enough space for the building to breathe. The Trinity Church was built between 1694 and 1702, when Prince Archbishop Johan Ernst von Thun ordered the construction to house a seminar for young men in training to become priests. The architecture was inspired by Roman designs. 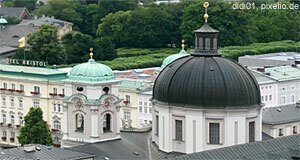 The Dreifaltigkeitskirche is famous for a paining in its dome by Johann Michael Rottmayr, which depicts the coronation of the Virgin Mary with the Holy Trinity.